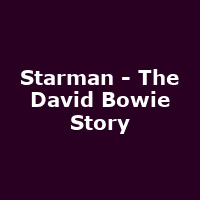 "Ziggy Stardust, Aladdin Sane, Thin White Duke, Major Tom and more. The many personas of David Bowie with one thing in common..... all delivered many of the most memorable, inspiring and lasting songs of a generation. From Rebel Rebel to China Girl, Let's Dance to Young Americans. Ashes to Ashes, Life On Mars, Changes, Heroes, Sound And Vision, Golden Years, Absolute Beginners, the list goes on and on."